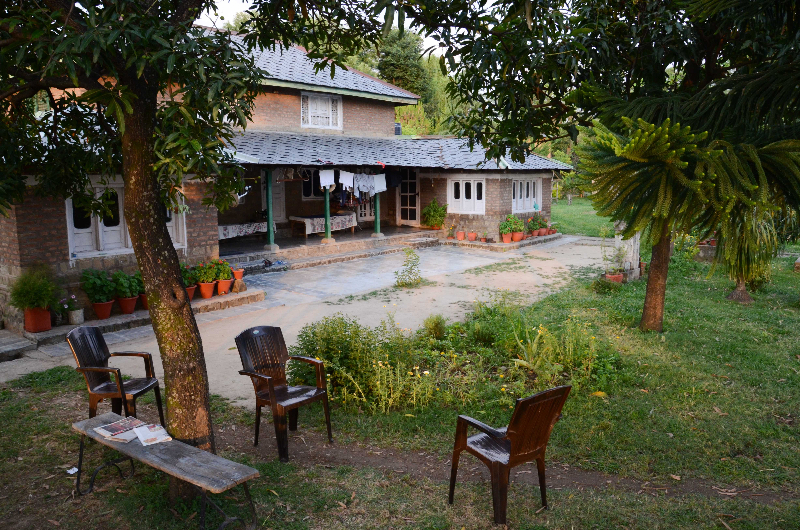 “DevBala Farm”, Devinder and Brij Bala’s farm. 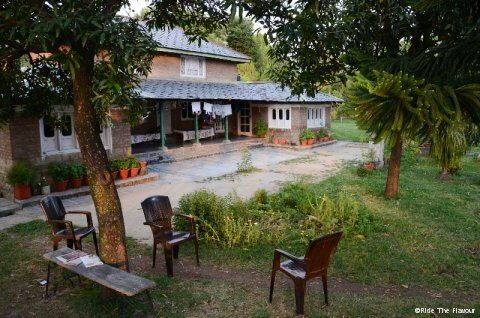 A little corner of paradise in India. They live on top of a hill overlooking wheat fields, and in the middle of a garden which hosts an almost incredible diversity! Tomatoes, potatoes, onions, cucumbers, spinach, peas, lentils, chilies, pumpkins, okra, garlic, ginger, mint, and a whole slew of spices (masala , cumin, curcumin , etc.) in regards to what grow at the ground level. And as for fruit trees, the list is not shorter: mangoes, lychees, papayas, guavas, lemons, avocados, cherries, figs, plums, walnuts, apples, pears, bananas, and Indian gooseberry (“amla”) . 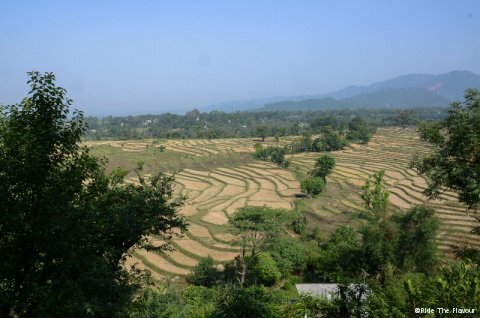 They also have two fields (1/2 ha in total) which they grow alternately (for 3 years, one rests when the other works) corn or rice. A few animals complete this plant swarm: roosters, hens and chicks for eggs and a cow for milk, manure and urine. And 2 awesome dogs, Djolo and Blacky! *To protect his plants from insects , Devinder sprays cow urine. He let urine ferment in a jar with sugar, and apparently the result is so powerful that each volume should be diluted in 2 volumes of water to avoid burning the plant. Overall, the farm provides for most food needs of the family. And the craziest thing is that 30 years ago this land was nothing but bushes. 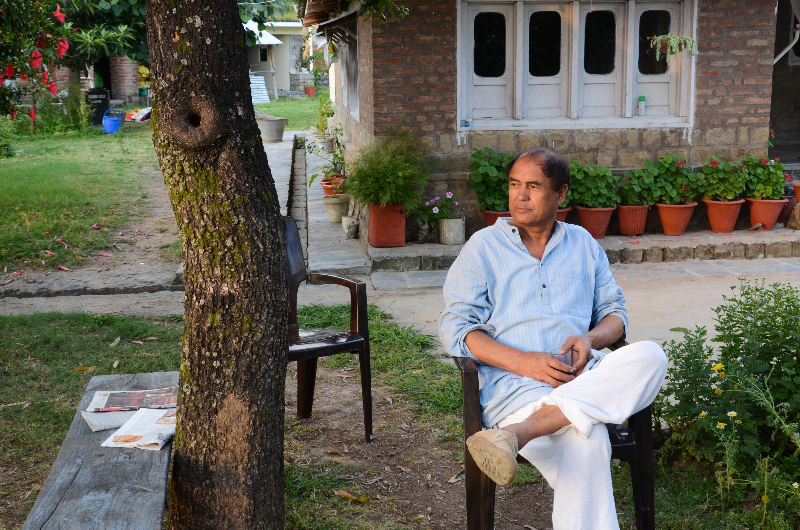 Devinder and Brij Bala have built almost everything themselves! And they have not put away their tools yet. 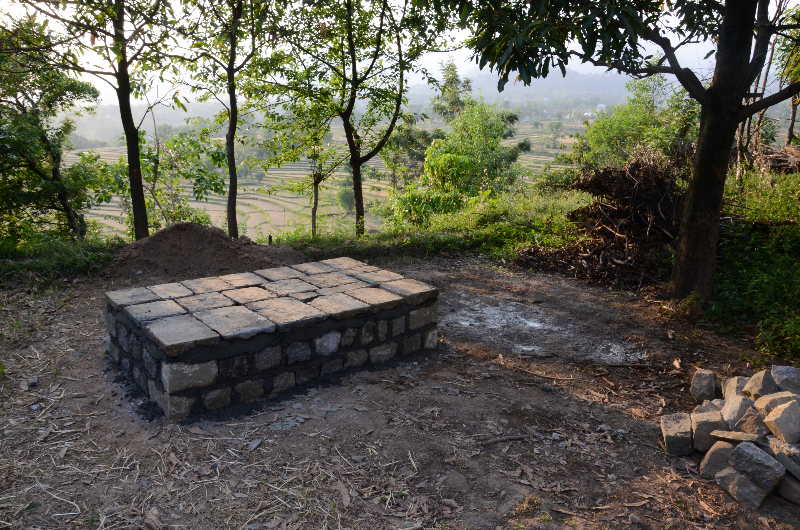 Devinder had the project to build a sustainable hive, made of stone and brick and taking into account his previous experiences. 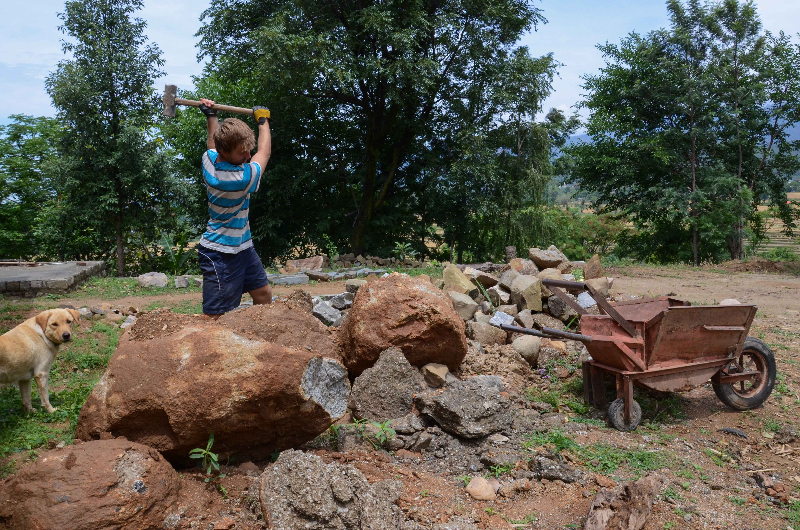 So I spent the first few days digging the foundations (with pick and shovel) and carrying stones (on my shoulder). The mason then built the foundations and the base of the hive. 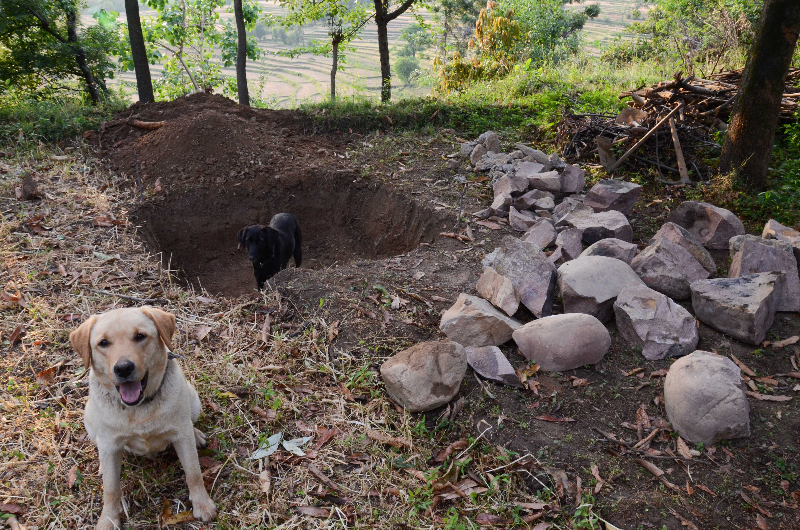 The hole ready to welcome the foundations (1.8 x1.2×0.6 = 1.3 m³ if we look at the math… but it was closer to 20 if you want my opinion! ), and the stones ready to become the foundations. Not to mention Djolo and Blacky. That’s all we had time to do in a week. It was not possible to complete the construction, but the work has now started… and Leo and I decided to involve the association Ride the Flavour in the project. As you know, we kept 20 % of the donations we received in order to help beautiful agricultural initiatives. 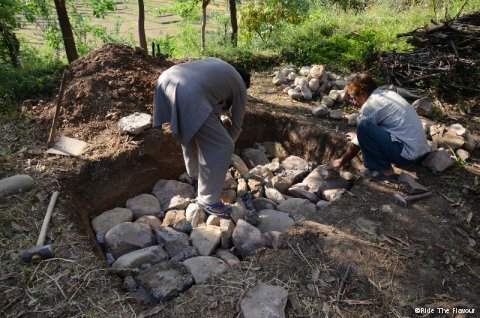 Before Devinder and Brij Bala’s work and its results, we have decided to fund the construction of the hive. A breath of fresh air for this family who is not rolling in money, but more importantly, we hope, a motivation to continue their work. The rest of the time, I helped with the usual tasks of the farm: watering plants, chasing chicks to put them back in the henhouse, digging vegetable out of ground lunch, plant a few new trees, breaking useless rocks to downsize and ultimately remove them (that’s it, now the photo makes sense! ), bringing and storing hay (it was the wheat harvest season) for the cow, etc. Devinder and Brij Bala’s approach is probably too family, not performance-oriented enough, to be developed on a larger scale. So what could be their role in the transition towards sustainable agriculture? Raising awareness. 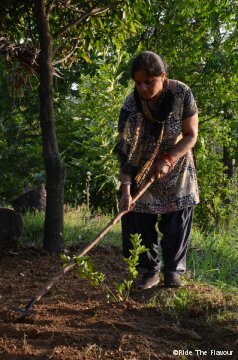 Devinder through his organic farm, and Brij Bala through her natural medicine, are the spokespersons for this traditional way of life, close to nature. They share it with WWOOFers and tourists who stop by (they have a few rooms that serve as a guesthouse), but also with other farmers in the area. 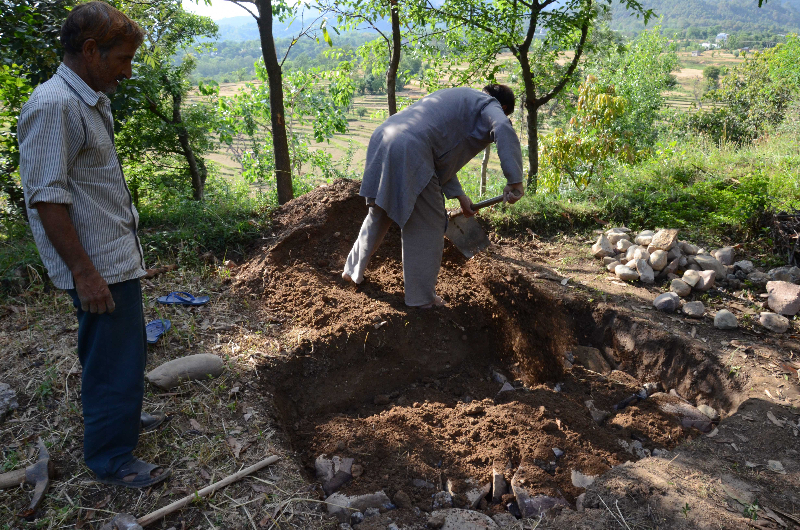 Devinder is highly respected in the region and try to encourage them not to use pesticides. Let me introduce you Devinder! And of course, what a beautiful human experience! After the first inevitable unsureness of any meeting, they really welcomed me as part of the family… And they became family! 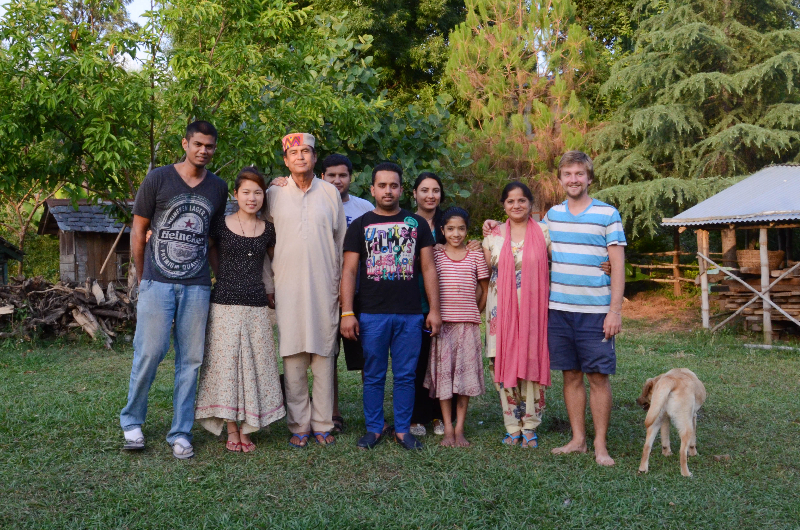 Thank you all, Devinder, Brij Bala, Sulekah, Priyanka, Guglu and Buti, for giving me such a rich week!